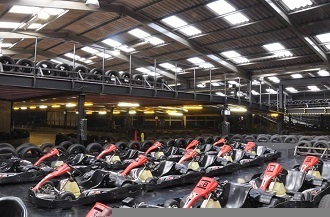 Right in the centre of the city the Manchester Arena also houses the UK latest kart circuit and with powerful battery driven karts even the ups and downs of this multi-level track are taken with ease. At 500 metres it's quite a 'busy' lap but the karts are well matched to the design of the circuit and driver of every level will get something out of it. Great facilities and good events. From M62 the Manchester Arena is situated on the A56 three miles from Junction 17 of the M62. At junction 17, use the left two lanes to take the A56 exit to Whitefield/Prestwich. At the roundabout, take the third exit onto Bury New Rd/A56 and continue to follow A56. Turn left onto New Bridge Street, then take a left on to Dutton Street where you will find Dutton Street Car Park.